I have just finished reading Barry Nesbitt's book, "What's On the Air Tonight" - and it brought back some great memories of listening to CKFH when I was a kid. I read your comments on RadioWest.ca about the passing of Mr. Nesbitt. Very nicely done. I was born in 1955, so when CKFH started playing rock music in 1967, I was all ears. Although CHUM was huge, there's always attraction among teenagers to do something "different" - and one of those things was listening to CKFH to demonstrate you weren't part of the crowd. And I was a hockey fan, so was on CKFH for the Leaf games. I used to stop in at 1 Grenville Street to pick up CKFH stickers, charts and other promotional items. Our family dentist office was in that old red building on the northwest corner of Yonge and College, so when I would go there, it was often a treat to stop at CKFH. And a couple of names in Nesbitt's book were familiar. Senator Keith Davey was at CKFH in his pre-Senate days. He lived in our street, Cassandra Blvd., and I delivered the Telegram to his place. Also, his son, Doug, was in my class. at Milneford Jr. High. I stopped by his house a few times, and knew him well enough to send him a letter when I was a Political Science student at the U of Saskatchewan and working on an essay about the Senate. He sent me a brown envelope, about two inches thick, of clippings about the Senate. Very helpful indeed, and a nice gesture on his part, I always thought. And Mike Hopkins? I went to school with his daughter, Honey Hopkins, also at Milneford. In grade 8, in one guidance class, when we were discussing career choices, we had to talk about our parent's jobs. When I found out her Dad was a radio announcer, I wanted to talk to her - about her dad. Ironically, a few years later, in 1971, our family moved to Regina, and I walk into grade 11 at Campbell Collegiate, and there is Honey Hopkins - her dad was then at CKRM Regina. Small world indeed. As I read this book, I noticed that Mr. Nesbitt was at CKFH and Telemedia into the 1980s. 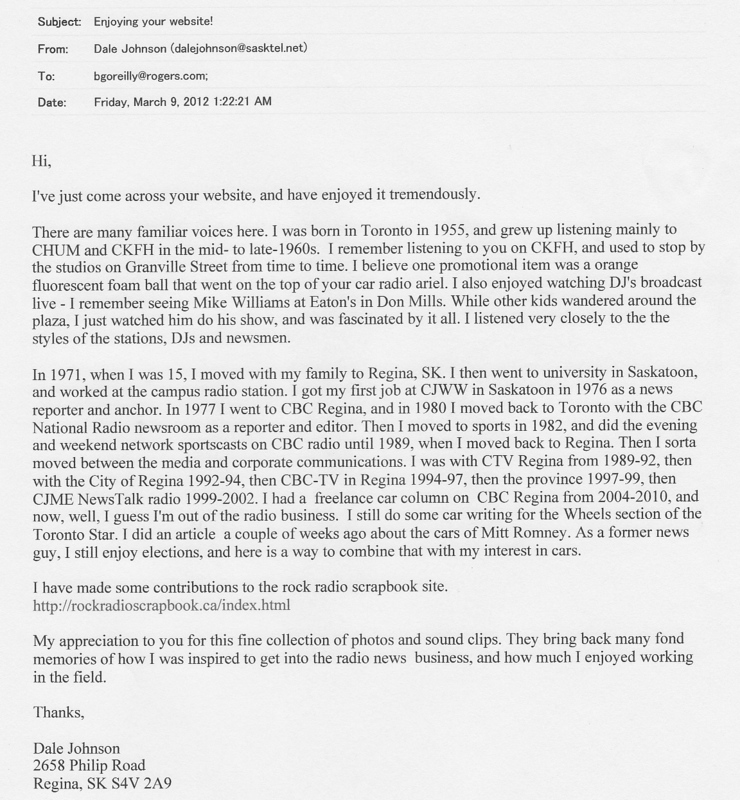 I worked at CBC national radio news and sports, at Carlton and Jarvis, from 1980 to 1989. Hard for me to realize that we may have been in the Yonge/College area during that era. It would have been a treat to actually meet him - although his book as sort of allowed me to meet him. Great memories, and an interesting story about Mr. Nesbitt. I'm glad I got to read his book.